Visiting the capital of Texas is sure to leave you with a city and outdoor mixed lifestyle for experience. Austin is known for its tech industry, SXSW, BBQ, and keeping it weird! I have beed to this happening city three times and each time was short and sweet. I’d like to offer you a quick guide to help you decide what to do when you visit Austin. My most recent visit was in December, 2018. Where to Stay: The Domain, Downtown, or South Congress. if you want to the ability to keep your car parked and walk around an area filled with shops and restaurants (more on the upscale side) go with The Westin in the Domain area. Like all Westin hotels it is extremely comfortable, convenient, with a little bit of luxury. If you do stay here, do make sure to take a trip to other neighbourhoods, because there is more to Austin than boutiques and brand name shops that you can find in any city. Most recently I stayed at the Courtyard Marriott in South Austin of Interstate Highway 35 and although the distance to South Congress was only a few minutes, I felt this area was too isolated and a little industrial. You can probably save a few bucks by staying in this area during peak season, but I think the prices are relatively the same. I wanted to stay in a different area and thought this part of town might be worth exploring. Big Fail! The fries had a tasty seasoning on it. Utensils are packaged in paper. Nice touch! Most places don’t consider the hygiene factor of leaving the utensils bar in rusting pail with crumbs in the bottom. This pail was clean and the utensils are wrapped in paper. Local goods available for purchase. Austin has an abundance of food selections and is popular for food trucks and bbq. On our way in to Austin, driving from Dallas, we chose to dine in at Greenhouse Craft Food. The chef crafted each item with the notion of farm to table making sure everything that is served is locally sourced and sustainable. We ordered Texas chili, a grilled pimento cheese sandwich, a burger, and a side of fries. Check out their menu. The environment is uber casual and since we were there on a weekday, it wasn’t too busy and our food was serviced within 15-20 minutes. We did have the mindset of patience and could afford to wait a little longer if we had to. Cook to order and farm to table is a specialty worth waiting for. All the great reviews we read were really on point. 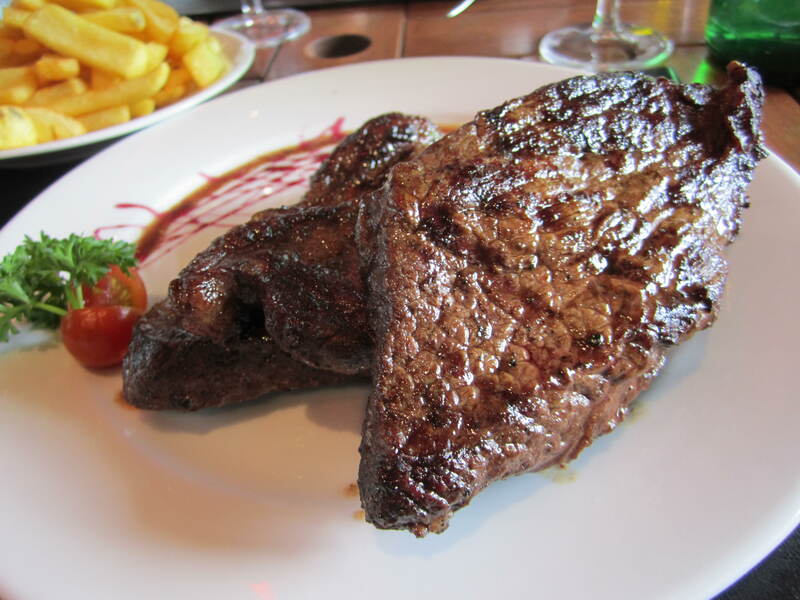 From the customer service, wait time, food prep, presentation, taste and quality, we were 100% satisfied. We had the flapjacks, and omelette, two scrambled eggs, and hashbrowns and coffee all for only $24.00. This new restaurants has a long and narrow interior with a 50s style diner feel. You can sit at the bar, in a booth, or if you are a party of two, you will be seated at the side by side tables that are almost too close for comfort with people on your left and on your right. Headsup: There is barely any parking in their lot and you will likely have to park on one of the side streets nearby. This area is a must on any day. Taking a stroll on this street is sure to give you that Austin vibe you have wondering about. Here you will find tons of local coffee shops, antique and boutiques, restaurants, galleries and the picture postcard featured as our main image. Residential is mixed in this area and you will notice massive aloe trees on many of the streets too. I took this photo right across the street from the Greetings from Austin Mural. Only a few minutes from downtown and South Congress you can experience the outdoorsy lifestyle. You can rent a bike or walk along the trail next to the lake, while you soak in the nature this city has to offer. If you thought Texas was completely flat, you have to experience the rolling hills on this scenic route leading up to this bridge (Hwy 2222). Once you get to the bridge, there are a few spaces to pull over beside the cliff and there is a pathway to hike up to the top. The hike up is only a few minutes and can be done by all age levels as long as you have a bit of strength to step over and up huge rocks. Take your time if you need to. I did see many elderly doing this walk up with help from their family. Once you get to the top the view is spectacular and photos are a must! Expect to spend 5-10 minutes here, unless you plan to meditate and do a complete photo shoot, but I wouldn’t leave my car parked for too long. The area isn’t zoned for parking and it is obvious that car windows have been smashed because there was a lot of glass around the area. Have you been to Austin? What do you recommend? Leave your comments below. San Francisco’s Pier 39 is a destination for everyone. As a local or a visitor, this is a great area to take a stroll, have lunch and experience a bit of nature along the Pacific Coast. I was recently in San Francisco and although I have been many times, I decided to spend more time at time at the wharf. This was my first time back at the Fisherman’s Wharf in 10 years. I spent a few hours here, checking out the stores, walking along the pier and of course gazing at the sea lions at Pier 39. The famous sea lions will always have a home at Pier 39. Since the earthquake in 1989, sea lions arrived in San Francisco and docked themselves here and by 1990 they had claimed the site as their own. With goodwill, the Marina Staff sought the advice of the Marine Mammal Center and after extensive research it was concluded that these sea lion be welcomed in their newfound home. Male sea lions can be as large at 7ft weighing in at 850 lbs and the Females can reach 6 ft in length and 220 lbs. Visit the local shops and restaurants. My favourite store was the The Spice & Tea Exchange. The population of sea lions vary depending on the time of year. It looks like there were about hundred on this day, but there can be thousands at times. Have you been to Pier 39? How was your experience? One of the greatest once in a lifetime experiences in Sydney is the $200 Sydney Harbour Climb. I remember watching Oprah and a crew of people, harnessed up to walk across the famous steel arch. Last December, I remember my husband and I having the thought of whether or not we wanted to embark on this thrill, gut wrenching experience. It was almost an automatic no for me, but I wonder if my husband would have opted in if he was with his pals. The experience is far too scary and unnecessary for me. I much prefer the more predictable and free option! After walking in The Rocks area we reached the entrance for the Sydney Harbour Bridge. Looking for gorgeous views of Sydney on a clear sunny day? Then you must put walking across the Sydney Bridge on your list of free things to do. Let the views begin and don’t take the engineering of the bridge for granted. Take your time and appreciate this distinctive landmark. The bridge connects two major commercial areas, The CBD of Sydney and Milsons Point. When you get to the other side you will be in Milsons Point. I’m not sure if the vendors are always set up at the foot of the bridge on the Milsons Point side, but if they are be sure to stop and look at the handmade crafts, antiques, and fashion from local artists. After walking across the bridge, you might want to take a break under one of these trees or chillax on the benches before hopping on the train to get back to CBD. Alternatively, you may want to continue exploring the Milsons Point area. Get an Opal Card and load up as you go. We bought our card when we arrived at the airport and loaded up the card as necessary throughout our stay. Taking the transit in Sydney is super simple. What comes to mind when you think of Arkansas? From Little Rock to desegregation to Bill Clinton to the Arkansas Razorbacks, this state is known for its friendly people and Southern hospitality. We experienced the love at every stop we made. Our top 3 sites to see in a short and sweet timeframe are The Little Rock Central High School, River Market District, The Bill Clinton Museum and the Big Dam Bridge. Many years ago I heard Minnijean Brown speak during a Black History Month event in Vancouver, BC, which is where she currently resides. Minnijean Brown is one of the Little Rock Nine, a group of African Americans who challenged racial segregation. At the time I heard her speak, I didn’t imagine I would one day experience the city and see the high school with my own eyes. You too, should make a stop at Little Rock Central High School and the museum to embark on a a piece of land with so much history. A visit to the William J. Clinton Presidential Library & Museum is a must. The Clinton library is filled with archives, including the daily agenda for each day of Clinton’s time in office. I enjoyed the short film, looking at all the memorabilia from his election campaign and even items from his childhood. The museum also has a wide collection of exquisite art, classified as the White House Collection of American Crafts. These pieces are the exact items that were used to decorate the White House in 1993. A guided tour of the museum is available at 9:30am, 11:30 am, and 1:30pm. We preferred the self guided tour and spent about 2 hours here. Make sure you see the replica of the Oval Office and the Cabinet Room. Cost to enter is $10 for Adults. Before or after you finish the Clinton Museum, take a walk through the River District and check out the local restaurants and shops. You can also take a walk along the many pathways in the area. Arkansas is very green and has a diverse landscape with some of the nations largest parks. Make your way out to the longest pedestrian bridge in North America, the Big Dam Bridge. This bridge is 4,226 feet in length and has never been used by trains or any vehicles. The bridge isis reserved for pedestrians and cycling and is often used for cycling races. The region expects to have healthier people and an improved economy. Have you been to Little Rock? What did you see and love about the city? For more gems in Arkasas, check out this blog. No matter what your style or scene is, these top three highlights of Atlanta are sure to make for a good time for anyone. There is a mix of history, broadcasting, good food, and a sensational museum to be enjoyed at all ages. CNN Tour. We paid $15 for an exclusive behind the scenes glimpse of what happens in the news room at this CNN Headquarters. We were able to ask all the questions that we wanted. I’m sure there is a lot of sensitive information that wasn’t shared, but the overview on production and what takes place during breaking news moments locally and globally was still interesting. The whole experience was about 1 hour and we finished at the gift shop where it was possible to buy souvenirs, including a picture of yourself as a reporter (for a fee). If you’re hungry, there is a food court in the atrium with typical fast food and some healthier options. 2. Sweet Auburn Historic District. The story of MLK is more than Black American history. His story is global and for all humankind. MLK was born in Atlanta. Along Auburn Avenue, you will embark on the home MLK was born in, the church his father pastored at, which later became the church he pastored at as well. MLK is also buried here and there is a memorial site with a couple of museums all within the same two blocks. Be sure to catch the two mini film documentaries in the museum, one which is the virtual tour of the interior of the home he grew up in and the other film is about MLK’s life. You might think that you know all there is to know about him, but I’m sure you will discover something new here. Estimated time to spend here: Minimum 1 hour, but plan for 2.5 hours. If you have enough time, you can fit in a visit to the Aquarium. I hear it is one of the best experiences of all aquarium visits in North America. The next time, I visit this city, I’ll have to check it out. Have you been to Atlanta? What would you say are the top 3 things to do? In support of world tourism, September 27th has been marked as World Tourism Day to promote growth of international travel and inclusiveness. This year UNWTO (UN World Tourism Organization) is focusing on innovation and digital advancements in the tourism industry. Technology has certainly helped me travel with more ease. I have been booking flights online for more than ten years and only used a travel agent to help with making more grand arrangements for my wedding guests and celebrations. Planning a trip is quite an enthralling experience and the tourism industry is constantly changing. Booking last minute travel and finding deals has become easier. Navigating through cities using google maps has made getting lost in a city a less risky experience. Using apps like Yelp and TripAdvisor make planning the agenda super easy. I often refer to blogs and instagram photos to map out must see places in a city. I even find the best doughnut shops with Instagram! Traveling through security has also seen a ton of advancements. From automated bag check in processes to automation at the security check to boarding passes scanned on mobile devices to TSA Pre-check and now most recently something call CLEAR. Everything is about speed. Connecting with people across the globe continues to get easier and safer. Don’t let language be a barrier. Google translate and other devices can have helped me connect with people and move around with more comfort than travelers did 20 years ago. My Spanish, Portuguese and Japanese are very weak and while in Colombia, Brazil, and Japan, I did my best to speak their local language and people always appreciated my efforts. Thank you Google for the help! Traveling to many cities internationally will you give you a real perspective of what problems exist and the gaps from country to country. We are witnessing countries create smarter cities and others that are still dealing with simple issues like lack of safe drinking water. The Smart Cities Council has a vision to use technology to improve livability, workability, and sustainability across the globe. I look forward to more positive environmental impact that digitalization will have on all countries across the globe. I never really had this city on my list of destinations, but now that I’m mostly in the southern US, why the heck not?! So what does OKC have to offer anyway. Like any city, upon arrival, I always grab all the tourist brochures and figure out what is supposedly the best things to do in the city. I usually try to figure out more of the local scene, but in such a short timeframe it wasn’t too imperative this time. For OKC…I decided to stick with the highlights. Inside the paid area of the botanical gardens. Myriad Botanical Gardens. This 15-acre botanical garden sits in the middle of the city and is home to thousands of beautifully displayed tropical and desert plants. The garden is like a symphony of plants orchestrated to be together. The garden is free and if you want to step into tropical zone the cost is $8 for Adults and $5 for children. Get ready to sweat when you step in there, even on a hot day it felt like I was walking into a sauna cranked up to 100 degrees. I was dripping in sweat before I even finished walking through. From the banana trees to coconuts to cocao to ginger, and lots of other cool plants you may have never seen up close and personal this attraction was a great experience. I rank this the #1 place to visit in OKC and it’s great for small children. A cinnamon tree. It was recommended to rub the leaves to release the fragrance. Unfortunately, I couldn’t smell anything. We jumped back in the car and drove through the Business District, Arts District, and Film Row because it was way too hot to walk around everywhere. We then drove to the Park Plaza area and made a visit to the OKC National Memorial. OKC National Memorial. This site and museum is a memorial that honors victims, survivors, and rescuers of the Oklahoma bombing in 1995. A National Park representative spoke for about 10 minutes to give the history and an explanation of the design. There are two gates, which are marked with the time before the incident and one at the moment everything changed (when the bomb struck). A field of empty chairs represents the lives taken on April 19, 1995. The East Gate is marked 9:01, which represents the moment of innocence for the city. The Museum and the Survivor Tree. The inscription next to the tree reads: To the courageous and caring who responded from near and far, we offer our eternal gratitude, as a thank you to the thousands of rescuers and volunteers who helped. We drove through Automobile Alley and didn’t really see anything. This must be more popular when there is an actual event happening. Our drive continued through Deep Deuce, which is a nightlife area and then we parked in Bricktown to grab a late lunch. There are a many restaurants, bars, and shops here and a nice canal, which also offers boat rides to cruise the canal for 45 minutes. We wrapped up our day here after eating quesadillas and soft tacos at the Yucatan Taco Stand. If you like riding scooters, there are plenty of Bird scooters available in this neighborhood. First time travelers to Japan will likely find themselves overwhelmed with all of the information that is available, EVERYWHERE. At least that is how I felt. I would plan and then get lost in my plan, then start over and get sent down a spiral of endless options again. I only had 9 days and I didn’t know where to start, what to do along the way or how to wrap up this potentially once in my lifetime adventure. I remembered what is important in life is to experience the experience. Regardless of what we chose to see and do it was bound to be memorable and our shared experiences will last forever. The reality is, there was absolutely no way to cover everything we wanted in such a short period of time. Even if we were heading to Japan for several months, I guarantee you that we still would not be able to see all the beauty and wonder the country contains. The highlights for me consisted of half the stay in Tokyo and the other half in Kyoto and we made day trips to Nara and Osaka. If you are planning your trip to Japan, put your mind at rest, pick what is important to you to see and do and have no worries. It doesn’t make sense to get stressed about any trip that you go on. Your on vacation and your mind needs to be at ease. Sometimes, picking less activities is more enjoyable. I left this beautiful country with more joy than I expected and by the grace of God I will have the opportunity to visit again. Thanking God for all my travels and more. Arashiyama Bamboo Grove. Only 30 minutes from Kyoto Station. Image Featured is Osaka Castle in Osaka. The Meiji Era was the first half of the Empire of Japan from October 23, 1868, to July 30, 1912. During this time the Emperor Meiji, led the industrial growth and modernization of the country and the Japanese people held Emperor Meiji and his family in the highest regard. I visited the Meiji Shrine located in Shibuya, Tokyo as it was ranked one of the top Shinto shrines to visit in the area. At the start of the path towards the shrine, I reached a wall of barrels of sake wrapped in straw. Every year barrels, pictured here, are given to the enshrined deities by members of the Meiji Jingu Sake Brewers Association along with members of other associations as a symbol of respect for the souls of the Emperor Meiji and Empress Shoken, whom was also buried here. Sake is a Japanese rice wine with a very strong taste and can have as much as 20% alcohol volume. Sake is said to be the oldest known alcohol that dates back to 4800 BC in China and 300 BC in Japan. By the 1300s breweries allowed for mass production and during the industrial revolution hand work by villagers was no longer necessary. It seems to be that since about 1904, Japan has been strongly branded with this fermented rice specialty. I drank sake with a coconut violet cocktail mix nearly every night for the second half of my trip. It became my tradition to wind down after a day of walking for about 8 hours. Respect be to the Emperor and family souls. Tip: Purchase a JRailpass (at least 2 weeks before you depart for Japan) to give you more flexibility to see more that just one city when you visit this spectacular country. I can hear one of my favourite tracks “Where the streets have no name”. U2 fans can hear it too. Walking through the streets of Tokyo had me practicing my patience at least 100 times a day and even with the frustration of being lost in translation, I still love this city! There are street signs, but they are not always easily visible and there are so many alleyways for shopping and sometimes dining. It’s easy to get lost. Thank God for my T-Mobile International plan. I was able to use the google maps to help us navigate. When using Google maps, put in the address you are going to but do not press directions. The moment you do, it will send you off course. Just load the location so that you can see where you are walking. It sounds weird, but I promise you this is the best way to use google maps right (May 2018) in Japan with a US phone. My eyes were faced with unending stimulation as I people watched, stared at the skyscrapers, bowed at the temples and walked through the parks and there were no shortage of sites to experience in this amazing city. I will definitely be back! Long ago, I heard about the efficient rapid transit and its complex map. Like my attitude with New York’s subway lines, I chose not to be intimidated and to just take my time to get my bearings (even with this method, the crew I was with still got lost a few times). Whether I was on the street or underground, I always had to pay attention very carefully to the signs. The street signs outside were not always obvious, but underground everything is written quite well, except the signage for elevators are less obvious. For every plan that you make in Japan, add an extra 30 minutes to your schedule to allow for your travel errors. No matter how good you are at reading maps and taking directions, you are bound to get lost at least once. If you have been to Tokyo, I would love to hear about your experience. How many times did you get lost? Getting lost is part of the fun, as long as you are not in a hurry to get somewhere. I find that you can learn more about yourself and a city when this happens. You also learn about the people that you are traveling with. It’s okay to go offtrack, especially in Japan. I never felt threatened or unsafe and people try to be helpful even if they can’t speak much English. This photo was taken in the Harajuku area. Fortunately, most tourist attractions do have elaborate signs with an arrow to point you in the right direction. Last summer I discovered a beautiful restaurant called Lavelle on King Street West in Toronto. I stopped by in the afternoon before the crowds to observe the beautiful skyline and enjoy the gorgeous rooftop patio. Something about rooftop patios designed with such luxury automatically gives me a burst of energy and pumped for a fun girls night out or a hot date with handsome husband. What are some of your favourite rooftop patios? As you can probably guess, the airport in Albuquerque is pretty small and as long as you have no checked bags, you can get out quickly and shuttle to your car rental within 15 minutes. Old Town is the most popular area to visit and see the artifacts, many of which are imported in from Mexico. We spent only a few hours before making the road trip for a one night stay in Santa Fe. This place brought a warm energy to my heart as it has a homey and vibrant feeling that gets everybody. They don’t call this place the land of enchantment for nothing. Peruse through Old Town, and make a stop in the quirky shop, Guerilla Graphix, which is a great place for awesome souvenirs, trinkets, and unusual things that bring memories to your favorite episodes of Breaking Bad. The architecture throughout New Mexico is a sight to be seen. The Pueblo Revival architecture is an adobe (mudbrick) construction and the walls are usually painted in earth tones. Wherever we visit in the world, we always admire old church structures. We took a walk through San Felipe de Neri Parish, the oldest church in Albuquerque. The original structure actually collapsed after a rain storm in 1792 and then this one was built the following year. There is a new area called Restaurant Row, which we heard about from a local, but we decided to stick with the nostalgic icons of Albuquerque and went to The Frontier for classic Mexican eats. This restaurant first opened in 1971 and it appears the owners want you to feel like it is still 1971. The establishment is well maintained and the washrooms were well kept. Side note, my mom always told me to visit the washroom of an establishment before dining and if the washroom is well kept it’s a good indication that they operate with high standards in the kitchen. Anyway…the place really is a down to earth casual style. You order your food at the kitchen counter, step aside and wait for your order number to be called. The restaurant is huge, the food was cheap and the place was packed. We took our food to go and we were in and out in about 15 minutes. Our next stop was a little wacky, but a lot of fans of Breaking Bad take a drive to the house where the show was filmed. An older couple has purchased the house as their dwelling and are forced to deal with dozens of cars that stop by to take a picture every day. They have even put up an iron fence to gate the home and pitched a sign that reads “take your photos from across the street”. Just as we pulled up, the couple decided to sit outside and stare at us and the others that pulled up for photos. They are obviously annoyed, but we got our pictures and didn’t need to linger for too long. I’m sure there is more to discover in Albuquerque, but we ended there and ventured out to Santa Fe. San Felipe de Neri Parish is located at 2005 North Plaza NW, Albuquerque NX. Frontier Restaurant is right across the street from the University of New Mexico. Day 1: Take a couple of hours to explore the area where you are staying. I always do this in every city that I arrive in. It helps me get to know the lay of the land. In Sydney, I stayed in the heritage hotel called The Grace. I highly recommend this hotel for its location, price, size of the suite and the maintenance. The Grace Hotel is centrally located and walking distance to cool places like the Spice Alley. After exploring your area and perhaps a little bit of shopping head down to the Royal Botanic Gardens. As you walk through the gardens, you will reach a point (right at the top of Mrs. Macquarie’s Road) where you have a gorgeous view of the Sydney Opera House. If you love taking photos, this will be a nice angle for you. After that, you can walk through the park to get to the Opera House. I walked into the theatre to chill a bit in the lounge. I didn’t leave without snapping a couple more pics of this magnificent place. Take a stroll along the Circle Quay and stop in to the Aboriginal Art Gallery. There you will find a collection of art from world renowned artists. A visit to Australia is not complete without learning something about its first rightful owners of the land. The weather was great and the sun was yet to set for several more hours so we took a quick ferry ride to the famous Bondi Beach. Leaving the beach and getting back into the central business district (CBD) is very easy. Just hop on a bus heading to Town Hall or St.James Station. Darling Harbour. Sydney is surrounded by water, so of course there are multiple spots to catch an amazing view of the city. Darling Harbour also has the Australian Maritime Museum and the Welcome Wall honoring more than 6 million overseas migrants that have settled in the country. I didn’t go through the entire museum, the first level is free and if you like American history you may enjoy the display. I perused through for about 10 minutes and then moved on to see more of Sydney. Barangaroo South. A short walk away is the Barangaroo South district, which is still going through development, but there is enough to please your appetite for food, retail therapy, and great photos opps. If you love walking head over to The Rocks, and tour the cobble laneways and visit with local artisans. You can cover this area in 30 minutes and then walk up to the Harbor Bridge. You can walk across the bridge and get an up close experience of this wondrous engineering without doing the BridgeClimb (which I was not interested in). Once you get across the bridge, you will be in Milson’s Point area. If it is a Sunday, there may be a local fashion market happening. You can catch the train from here back to where ever you need to go (perhaps your hotel to take rest). Manly, Manly Beach, and if you have time head up more north to Palm Beach. If you make it to Palm Beach, plan to veg on the beach because there is nothing around in this secluded area, except gorgeous mansions, one restaurant and a small shop. It took about 40 minutes from Manly to get here by bus and it was well worth it. There are multiple ways to get to Manly. You can use the fast ferry or take the Manly Ferry (which is more economical and you can use your Opal card). Both options will give you the spectacular views of the Sydney harbour and surroundings. If you like to discover neighbourhoods that feel more local, yet still have something to offer tourists, then you need to hit the Spice Alley. I heard this place referred to as a little Singapore in Sydney. I have yet to travel through Singapore, but the plethora of food option, flavors, and smells is exactly how I imagine Singapore to be. Spice Alley is in the heart of Chippendale and don’t get this name twisted with the male tour group. Chippendale is a happening area popular for its converted warehouses, galleries, green space, and shopping. There are more touristy things that you can do like, visit the Blue Mountains, The Toronga Zoo, and do the Bridge Climb. All of which, I have heard amazing stories. If you have done this, let me know about your experience. Getting around by public transit in Sydney is super easy. You will need to purchase an Opal card, which you can do upon departure from the airport. For all the insider tips on getting around with public transit click here. This is what you can expect to see when you drive up the coast in Queensland. In Cairns, you will need to rent a car to really explore the area well. We drove about 130 km from Cairns to the Australian rainforest of Daintree National Park. Millions of years ago, much of Australia was covered by rainforest. The climate became drier as glaciers disappeared and continents shifted. This area is one of the last refuges of Australia’s tropical rainforest and owned by the Aboriginal people, specifically The Eastern Kuku Yalanji people. Upon arrival, you will be welcomed at the visitor center with educational material and a souvenir shop. You can buy a shuttle bus ticket, which will take you up the road getting you closer to the Mossman Gorge and saving you walk time. The tour bus will take you along this road to get you closer to the Mossman Gorge. You are welcome to walk this road as well and the walk is about 20 minutes. Here is where the bus lets you off and picks you up. Walked across this bridge before approaching the crystal clear water over large granite boulders. You can go for a refreshing swim here, but be careful as there are turtles here, which I’m sure are harmless. You never know though…there could be baby crocs here too. Walking back to our car, we passed by some homes and saw this unique bird. It might be a yellow oriole bird. If you love beaches and you have looked at possibly visiting New Zealand then you likely have heard of Piha Beach. This is a world famous surfers beach 40 km west of Auckland. A friend had told us to “hire a car”, that’s kiwi speak for “rent a car”, upon arrival in Auckland and start touring around as much as possible. I absolutely loved the drive along the coast, but it wasn’t easy. First off, we were driving on the left side of the road and the driver’s seat is on the right and to top it off we were driving up the mountain and many times we were so close to the edge, I feared for my life. Be encouraged though, as the drive is worth the eye-popping experience. You will see lush green hills and valleys with abundance of wildlife including sheep, cows, and alpacas. You will make windy turns up and down the hills and finally come down to Piha. When we arrived I felt my mind and spirit reach a state of calm. I thought, “aaaaaaaaah, Piha”. Piha Beach is a beautiful black sand beach surrounded by enormous cliffs. I’m not a fan of black sand though, it was too hot and I had to keep my flip-flops on so I didn’t burn the soles of my feet. After spending some time on the beach, we took a hike up the rock to have a beautiful aerial view. You will also find secluded beach areas. Be careful though the sea here can be vicious and life threatening. Visiting this place from Auckland is an easy short and sweet day trip. I am so thankful that I connected with this part of the world. All praises and glory to God. There are over 10,000 beaches in Australia and to be exact the University of Sydney has counted 10, 685 beaches. I would not be surprised if there are more in hidden places that man has yet to walk. My trip was short and sweet and I only had a chance to visit a few places. I never get tired of visiting the beach, even though my purpose is not to tan because I am blessed with dark skin. I love the sun and for its rays to kiss my skin giving me the dose of vitamin D that my body needs for good health. I love listening to the sounds of the water and feeling more connected to the earth. When I get to the beach it is my moment of peace and calm from all the chaos and pollution in any city. This post is to highlight one beach in Northern Sydney. The journey we made to this beautiful beach took us about 90 minutes and we started with the Manly ferry from Circular Quay. The ferry ride is about 20 minutes and boasts spectacular views of the Sydney Opera House and the Harbour Bridge. Once we disembarked from the ferry, we walked to catch a bus to Palm Beach and that bus ride was about 60 minutes. I like taking the bus so that I can view the city as the locals do everyday. The long bus ride is worth it and you will realize that as you begin to approach this affluent area where the median home is selling for $2.6 Million. A little fun fact for you: the long running Australian tv show, Home and Away is filmed here. Palm Beach is along the Tasman Sea, within the South Pacific Ocean. I was there on a December afternoon and the sky was a bit overcast, but there was enough sun to lay out and veg for more than a couple of hours without the risk of getting burnt. The tide and temperature of the water was perfect for riding the waves and as we frolicked with every wave. The surfers were nearby catching the bigger waves outside of the swimmers boundaries. Let me remind you that when visiting the beaches in Australia, you must stay within the yellow and red poles, which are marked as the safe zone monitored by lifeguards on duty. The waves can shift and mother nature can be violent at any time. There is also a public pool at the end of the beach which we noticed wasn’t busy. In that area, you can take a walk along the huge rocks and admire more of God’s creation. Palm Beach is one my favourite beaches in the world. I still have more to see! As always, thank God for travel! Take bus 29 to and from Manly. Uruguay is a little laid back country with a ton of charm. I liked this country more than I expected I would. Before the trip was complete I was already thinking this is a country I would love to come back to. I traveled with my husband and my sister and we flew from Miami to Montevideo. Since my husband uses TMobile (which includes South America in the plan) it was easy to get an Uber from the airport right into the city center for about $30USD. We stayed at My Suites in the upscale neigborhood called Pocitos and from there it was easy to walk around and catch an Uber for about $5USD for anywhere local that we wanted to visit. There are so many things that I can say about Uruguay, but for this post let me give you the key reasons why I think you should add this country to your list of places to visit. Uruguay is one of the safest countries to visit in South America. We walked around in the day and at night and always felt comfortable as we toured around the city streets. Of course we were in a group of three, which may have helped, but from what I noticed as long as you exercise caution you likely have nothing to worry about even if you are traveling alone. This country has a good economy and most people live a very good life, in fact the World Bank labeled this place as a high income country. Uruguay has a blend of cultures. The influence of Spanish, Portuguese and Italian is upon this nation and there is also an African presence. If you are around on Saturday afternoon, you can catch a group of people drumming in front of the City Hall. We missed this as we were in Punte Del Este. The beaches and gorgeous coastline. If you have time take a trip out to Punte Del Este and other cities outside of Montevideo to see how beautiful the coastline really is. There are too many beaches to choose from in Uruguay and surprisingly good surf in Punte Del Este. I don’t know anything about surfing, so perhaps I shouldn’t have been that surprised anyway. To get there, take a bus from Tres Cruces terminal. The cost is $18USD each way and I recommend that you buy your tickets a day in advance to ensure that you get a seat. The bus allows people to stand, but you don’t want to be standing for 2 hours. Great food. 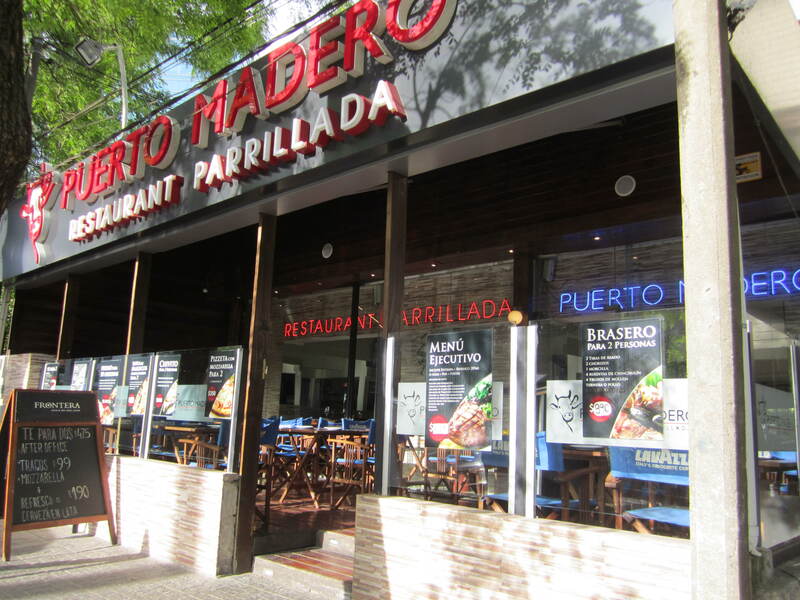 There is a vast selection of restaurants to choose from for asado, pizza, chivito, cafes and even nice fast food joints. I will do a food post soon about all the food we experienced, including the restaurant La Otra. We later found out Anthony Bourdain visited two weeks ago for his show Parts Unknown set to air in 2018. Kind people. Spanish is the main language spoken, however you will be able to get around even if you don’t know any Spanish. Some people speak English and will do as much as they can to welcome you to their country. We met one woman in the market who spent about 10 minutes telling us about Uruguay and that racism does not exist there. She went on to say that Uruguayans have an African population and they want to see more Africans because there are few. She spoke about the history and the culture and she was so proud to share her experience with us. I always like to talk to locals to get a feel for how they live. This place is laid back. There seems to be no stress here. The architecture. Visit the Old City, also known as Cuidad Veija, to take in the beautiful old structures. Make sure to go up to the 22nd floor of the Montevideo City Hall where you can take in a view of the city for free. The largest outdoor market. If you love to find unique bargains in markets, then you will want to spend an entire Sunday at the Tristan Narvaja. Here you will find antiques, food, clothing, and art. This is the most popular market in the entire country. Less than a full day is crazy short in any city, but still doable. Get a taste of a city you have never been to and call it a short and sweet trip. The Museum of Mississippi History. Park outside of both museums and decide if you have time to see both this museum and the Mississippi Civil Rights Museum. For lack of time and because we have previously visited the Civil Rights Museum in Memphis, we chose to focus solely on the Museum of Mississippi History. The artifacts found here go as far back as 1902 and cover the history from Native Americans, Black American, slavery, migration from around the world, the great Mississippi flood in 1927 right through to the current status of Mississippi. Be curious and notice the innovation they have created to make this museum interactive and intuitive. Along Capital Street, you will pass by the beautiful Greek revival mansion. Built in 1842, the architect, William Nichols was going fo plain republican simplicity. Designated a National Historic Landmark this is the second oldest occupied gubernatorial residence in the USA. It is closed on the weekends, so we didn’t get a chance to tour the property. If you arrive from Tues-Fri, between 9:30-11, you can tour for 30 minutes for Free. As you drive around the city you will embark on The Mississippi Freedom Trail Markers. Each site plays a pivotal role in the Civil Right Movement. Grab a map or guide and plug in the addresses on your GPS. We made a stop at Medgar Ever’s House. We noticed that Jackson seemed to be quite a depressed city. We believe it is the city of soul, but it is very obvious that they are left behind in terms of care for the roads and infrastructure. It seems like a city lacking funds to take care of municipal requirements. Most times, we weren’t sure if we were in a safe neighbourhood, but we took our chances and followed the GPS. We went to a quaint part of town called The Fondren District. This historic area is an eclectic mix of shops, cafes, galleries and charming homes. You might want to stop here to eat or even just have coffee. Every trip requires a comment about food. A friend from Jackson, recommended a few places and we decided to go about 15 minutes outside of downtown and also quite a way from the Fondren District. We wanted a place with the most highly favoured soulful experience, Bully’s Restaurant. There is only one location for this specific restaurant and they have been serving soul food since 1982. Driving up to this restaurant had us questioning if we were going the right way. It seemed like we were driving to a dead end. Just as we thought the GPS was messed up, we pulled up to this little stand alone building with a very small parking lot. This dine-in soul food restaurant also completes take-out orders. In fact, we saw more locals coming in for take-out than dining in. The longtime staff know their customers and greet everyone with the Southern hospitality we were looking for. The menu includes everything we expected including chitterlings, oxtails, rice and gravy, turkey wings, neckbones, fried okra, mac and cheese, beef ribs, and a whole lot more. We had the beef ribs, sweet potatoes, cabbage, and cornbread. The owners knew we were tourists, and went out of their way to greet us with joy and check on us more than once. If you want a down to earth experience and nothing fancy, check out Bully’s. There’s always more to do, but with so little time, that’s all we got to cover. Have you been to Jackson? What did you see and do?